So here is something that is so me. I’ll see an interesting ingredient in a recipe, jot it down without reference the recipe, pick it up, and then have no clue where to use it. I need to make some kind of note as to what recipe/s it is for. Well, I finally used one of those ingredients, candlenuts! They have been sitting in our cupboard unopened for ages. 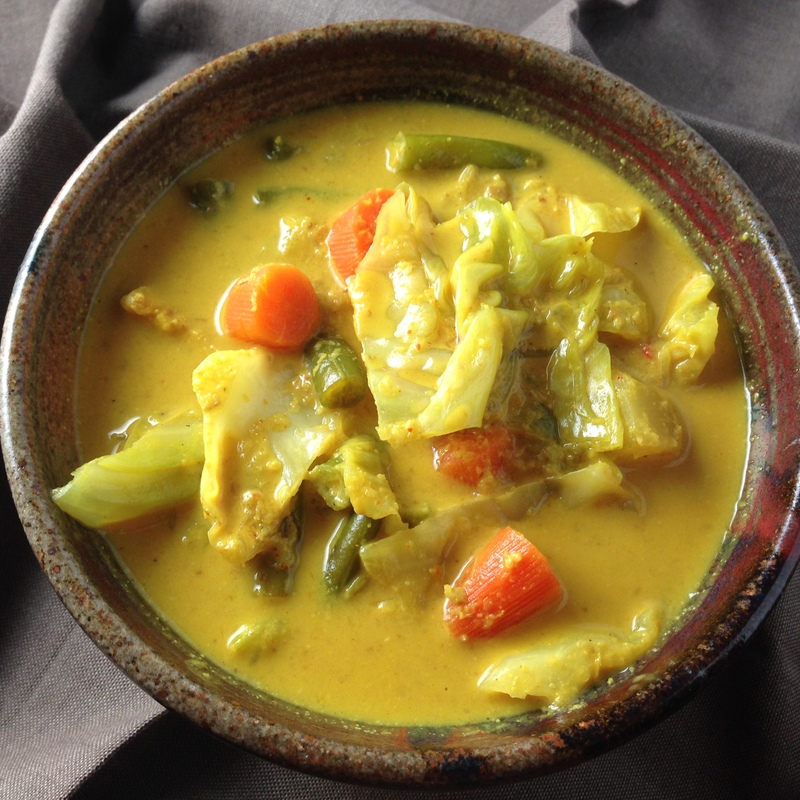 But finally…a few of them found there home in this Malaysian coconut stew, Sayur lodeh. Sayur lodeh is a vegetable stew with coconut milk that has versions in Malaysian and Indonesian cooking. The recipes I used to come up with mine (fatboo.com and kampungsingapura.com) were Malaysian, but then used tempeh instead of tofu which is a more Indonesian ingredient. The only tofu we had was the super soft Korean kind for soon tofu and I didn’t think it would go. The first added the Indian elements of mustard seeds and curry leaves, but I left them off this time. I generally keep galangal, lemongrass and Thai red chilis in the freezer. They keep pretty well and are much better than dried varieties. Of course, fresh is always best, but we aren’t super close to any Asian markets, boo hoo! I would say my only complaint about this stew is that it is hard to get the galangal and lemongrass really smooth in the paste so there is a little bit of a grainy texture. Any ideas? Maybe it takes more oil? Grind all the paste ingredients with a little water until as smooth as you can get it. Heat coconut oil in a saute pan and cook the paste until the raw smell goes away (this takes a while and needs to be stirred often so it doesn’t burn!). Add more coconut oil if it sticks too much. Meanwhile, in another pan, fry the tempeh in the rest of the coconut oil and set aside. To the paste, add the turmeric, chili powder, potato, carrots, water and salt. Cook for a few minutes, then add the green beans. Once the potatoes, carrots and green beans are almost cooked, add the cabbage and coconut milk. Add any water or salt if needed, cook until the cabbage is wilted, and serve.